How exciting!! Your toddler is walking, eating table food, exploring their new environment and learning so much about their world. 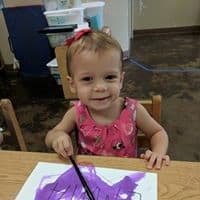 Our Toddler One teachers are committed to continuing the nurturing and learning that began in the infant program by providing a safe, stimulating and enriching environment for your one year old. Our theme-based curriculum encourages play, language development and discovery, allowing children to explore their world in a meaningful way. Trillions of brain-cell connections called neural synapses are formed in a child’s first three years. Experiences and interactions shape whether or not neural synapses are formed. Neural synapses that don’t form are lost forever. Lifelong success comes from the experiences and interactions your child had during his or her first three years. 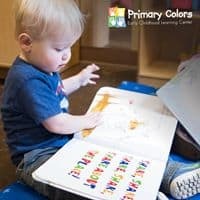 Primary Colors knows that toddlers learn best through play as they explore, experiment, discover and have fun. Our young toddler program is designed with the playful child in mind. We use entertaining ways to construct strong neural scaffolding upon which later skills will be built. In our Toddler One Program your inquisitive little learner can channel his or her boundless energy and curiosity into fun activities in a safe, stimulating environment. Our teachers patiently guide you through this time of immense growth. Art, music, movement and active outdoor playtime foster cognitive, social-emotional and physical development. Your child will have lots of choices to express his or her self-confidence and blossoming independence within our well-structured Toddler One Program. Your toddler is walking, starting to talk and very inquisitive about the world around them making the toddler years prime time for learning. The brain’s ability to develop with new stimuli is greatest in children under three because this is when trillions of brain-cell connections called neural synapses form. Unfortunately, synapses that fail to connect are lost forever.The learning centers in our toddler classroom are designed to stimulate early development through fun, engaging activities. Cognitive:A host of factors influence brain development during these formative years. Chief among them are the safety and security of the environment, responsiveness of caregivers, and exposure to talking, reading, singing, and other mentally stimulating activities. Social-Emotional: Understanding individual feelings and the feelings of others, managing emotions in a constructive manner, regulating behavior, and maintaining relationships are essential to healthy social-emotional development in toddlers. Positive ongoing relationships with nurturing teachers and communication about thoughts and feelings are important as toddlers discover themselves, peers, and adults. Physical: Eager to explore the world around them and their newfound physical abilities, toddlers’ little bodies sometimes struggle to keep up with their imagination. As their gross and fine motor skills continue to develop, toddlers need plenty of safe indoor and outdoor space to walk, jump, run and play. Toddler Discover: Toddlers learn best through play as they explore and discover, and there’s no better place for this than the centers in our toddler rooms. Whether your little prince or princess is building with blocks, painting a masterpiece, or using a magic wand to change a pumpkin into a coach, your little one can imagine to their heart’s content with all the props, costumes, and art materials in the classroom. 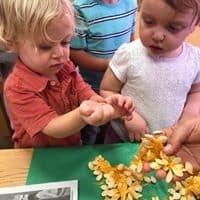 Early Learning: Our theme-based curriculum nurtures your toddler’s excitement for learning with fun, age-appropriate learning activities involving language, colors, shapes, motor, art, music and movement. Talk, Talk and More Talk: Language exposure and participating in conversations in the first three years of life creates the foundation for cognitive thought, reading comprehension, and healthy socialization. Our toddlers are encouraged to talk, talk and talk some more with their friends and with their teachers. Sign Language:Your toddler will continue to learn and use sign language. 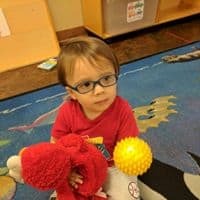 There are many times when a young toddler does not have the verbal language to express a need to an emotion and this can be frustrating for your toddler. Sign language gives toddlers another way to express their needs and emotions as their verbal skills develop. Socialization: Our toddler teachers guide your child through first friendships, learning to share and being kind to friends with stories, songs, finger plays, movement and music activities. Independence: Toddlers have many opportunities throughout their day to build their independence and forge their identities. Toddler love to “do it my way” by picking up toys, putting on their coat, playing with a friend, washing their hands or passing out napkins. Movement Fun: Our young toddlers love to move. They learn how their bodies work by moving and developing important motor skills. They express their independence by dancing with the music and playing movement games. *Programs and activities may vary by school and may be subject to change without notice. Please contact your local school for additional information on school-specific programs and activities.